Along with loafers, button down blouses and over-sized confections, pinstripes aren’t just reserved for the boys anymore (or the 80’s for that matter). Designers have once again taken a trend from the past, readjusted the silhouette, and restyled it to give birth to something that is simply chic and inspiring. From structured tops to blazers, sweaters and tailored trousers in all shapes and sizes, pinstripes are back in a big way. However, if you want to keep the trend more casual, simply pair the patterned piece with daytime wear. I chose to style my pinstripe blazer with denim and an organic white tee for a look that makes taking charge of the concrete catwalk seem effortless. I am on the search of a pinstriped suit. I love your jacket and how you contrasted it with the red sandals! Beautiful job! I just love these heels and you styled it perfectly with your oversized blazer. Such a flattering look on you! I totally agree with you. These blazers are great for women too. Love your outfit, you look gorgeous. The pop of red is fabulous. Love this style and that blazer with the red heels is perfect! Great styling. I could see myself wearing pinstripes again looking at your outfit. Really practical and a great change from a normal jacket. 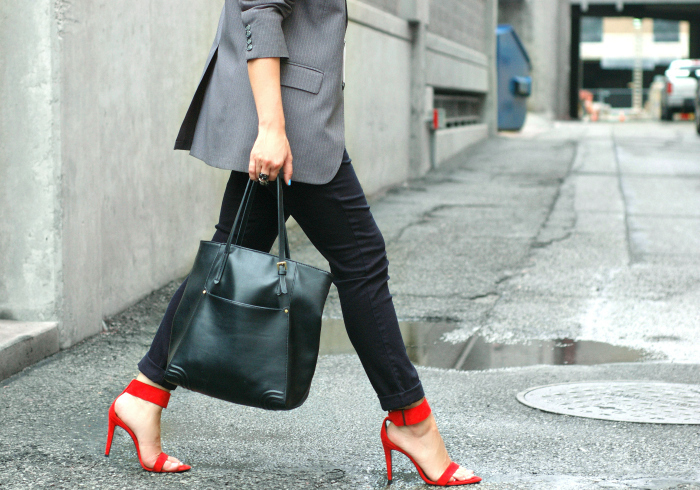 Love the pop of red with the heels! Love the menswear feel- and THOSE HEELS. Yessss. I’m a big fan of menswear pieces & pinstripes too, but I’ve not been able to find any nice ones in black lately for a reasonable price. This outfit is killer, love those red heels with it! Thanks. I saw a few pinstripe pieces at ASOS and Zara. Maybe swing by their shops for other pinstripe pieces at great prices! Amazing, what else can I say? I need this blazer in my life!! Loving this blazer and those red heels!! Gorgeous as always! LOVE this look, so chic and classic. The pop of colour is perfect! Great look altogether! Love your blog, thanks for visiting mine! Really good outfit, and this red high heels are just perfect !!!!! !